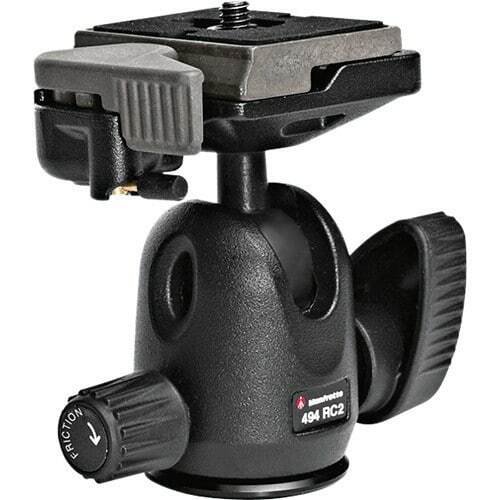 This 494RC2 Mini Ball Head from Manfrotto features an integrated RC2 quick release cam lock and a 200PL-14 Quick Release Plate. Compatible quick release plate can removed from the head by pulling the cam lock's spring-loaded lever, which also allows the plate to be instantly reattached. The cam lock also features a safety catch to prevent a compatible quick release plate from accidentally disconnecting. The 494RC2 Mini Ball Head with 200PL-14 Quick Release Plate has a load capacity of 8.8 lb and can be attached to tripods or other support systems that feature a 3/8"-16 mount. By loosening the 494RC2's locking knob, its ball-and-socket joint can be quickly swiveled, angled, fully tilted, or returned to its upright position. An additional knob opposite the locking knob can be rotated to apply tension control to the ball-and-socket joint's movements. Cameras or accessories that are compatible with a 1/4"-20 mount can be connected to the 200PL-14 quick release plate, which measures 1.7 x 2.1 x 0.4" and has a rubberized, non-slip surface.